* RIFT 1.9, packed with new features to go check out! * For massive 3-way cross-shard PvP, take a look at CONQUEST! * New MENTORING system allows you to play lower-level content with your friends or solo. * A brand new set of INSTANT ADVENTURE comes to Freemarch, Silverwood, Gloamwood, and Stonefield. * Give your character a whole new look with the BARBERSHOP! * PRIMEVAL FEAST is a new 10-player Sliver featuring Fae Lord Twyl and his plans for Lord Greenscale. * The Prestige rank cap has increased to 50, and along with it comes all new PvP Armor sets! * Summer comes to Telara and the Ascended are encouraged to enjoy the outdoors with SUMMERFEST! * Conquest is a three-way, cross-shard, cross-Sliver battle royale where three factions of Ascended are caught in an ideological struggle for the future. 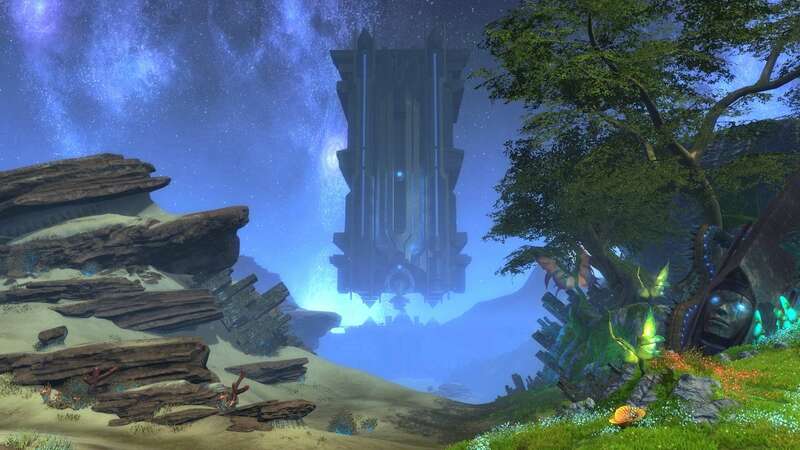 Guardian or Defiant means nothing here - this is about the role of all Ascended on Telara. * The lands of Stillmoor play host to epic battles, where war means fighting in large and small skirmishes for land control, Sourcestone reserves, crafted reinforcements, and PvE objectives. * Access the Conquest menu by hitting 'K' and selecting the Conquest tab, or by selecting Conquest from the Activities menu. * Temporarily align with one of three factions before joining Conquest - but choose wisely, because you cannot change your mind once a battle is underway. If the number of participants skews too much toward a single faction, that faction will be unavailable and greyed out. * Win Conquest by taking control of 60% of the Extractors on the map, or having the most number of Extractors controlled after reaching a cutoff number of PvP kills in the match. * Once a team has Conquered the zone, their faction will be the only one allowed to respawn within the instance - though members of other factions may still remain in the zone! Race to destroy Planar foes and foci to gain additional rewards during this phase. * Gain Conquest Power by defeating your enemies or taking and holding Extractors. Conquest Power unlocks benefits for your character that are visible on the Conquest menu - these benefits remain outside of Conquest as well! * Gather Sourcestone and return it to your base to allow crafters to create faction-wide buffs for your battle. * New crafting recipes for Conquest are available on the Quartermasters inside the Conquest instance. * New items are available from the Quartermasters as well! * Check with the Defiant or Guardian Battlemasters in Sanctum and Meridian for a new PvP weekly quest for participating in Conquest. * New Mentoring system allows you to set your character's level below what it actually is, whether you're on your own or playing with a lower-level character. * Mentoring is available to characters of level 15+ and can only be used to reduce your current level, not increase it. When choosing a mentor level, it must be 5 or more levels below your current actual level. * The new Set Ascended Mentor Level menu option now appears when right clicking your own character portrait. You can choose what level you'd like to set your character to from this option. * When right-clicking the portrait of another character, the menu option to set your mentor level to the target's level appears. * While mentoring, your stats, abilities, regeneration, etc. will be temporarily reduced in line with the target level. * Grouped characters in a group where someone is being mentored will receive bonus experience as long as the Mentor remains within 3 levels of the lower-level character they are mentoring. * You can also set your Mentor level using the /mentorlevel slash command. * New Instant Adventures are now available in the zones of Silverwood, Freemarch, Gloamwood, and Stonefield. * The new Adventures are appropriate in level for the zones they take place in, but in a tie-in with the new Mentoring system, can also benefit higher level characters looking for a change of scenery! * If your character is in one of the four zones listed above, and is mentored to the zone's level range (either solo or Mentoring a lower-level character), you'll be able to queue to join Instant Adventure in that zone. Characters who are naturally of the zone's level will also be able to queue. * Higher-level characters who aren't already Mentoring can now queue for Random Adventure, which will automatically Mentor you to an appropriate level to take part in these lower level zone Adventures if a group is available. It may also place you into higher level Instant Adventure groups as needed. * Random Adventures provide bonus rewards for the first 14 you complete each day. * Experience and Sourcestone rewards will remain appropriate to your character's natural level, even if you are being mentored. * If Mentoring to a lower-level Instant Adventure participant, you'll receive bonus Mentoring experience the same as non-Instant Adventure Mentoring would. * Item Caches obtained through lower-level Instant Adventures can contain green-quality equipment scaled to your character's natural level and Calling. Characters who are still leveling and taking part in these new Adventures will find these items comparable to quest rewards for their actual level, so you won't be missing out on gear by leveling via Instant Adventure! * Long-awaited Barbershop NPCs have set up shop in Sanctum and Meridian! * For a fee, characters can change any aspect of their appearance aside from character race or gender. The price ranges between simple cosmetic procedures - new hair colors, or new styles - up to significant, dramatic alterations such as height changes, facial features, and skin tones. You can see the total combined cost of your current changes while in the customization screen. * The new Sliver of Primeval Feast has been discovered in Droughtlands! * As a companion sliver to Infernal Dawn, Primeval Feast is intended to be more difficult than the challenges of Rise of the Phoenix, and its rewards appropriately more powerful. * Fae Lord Twyl, after consuming Greenscale's power, is on the rise. The Plane of Life runs rampant, devouring all it can reach - running low on prey, they turn on Lord Greenscale himself, attempting to consume the dragon of Life and his essence. It's up to the Ascended to give them a good pruning before Lord Twyl and his minions expand unchecked into other Slivers of Telara to feed their hunger! * Prestige Ranks are now increased to 50! * The added ranks offer new milestone titles and additional Planar Attunement bonus experience when attained - 2 Planar Attunement levels worth for each rank. * A new set of PvP Armor is now available in line with the Prestige Rank increase. * Added Hit and Focus to PvP Set 2-5 weapons. The values should fall about two tiers below comparable PvE weapons. * Increased the effect of Bolstering in line with the addition of new PvP gear. Bolstering is now applied to all characters up to rank 36 in both Warfronts and Conquest. * Pack up your picnics and don't forget your bug spray! Summerfest comes to Telara, and no Planar threats can keep people holed up in town. * Enjoy the outdoors in this new annual event with activities anyone can enjoy. Go on a scavenger hunt, chase some friendly wildlife for pets, ride a barrel down a waterfall, or just picnic on the beach - but keep an eye out for the Swarmlord and his bugs! * Summerfest event currencies can be used to pick up loads of fun new items - fun polymorphs and costumes, new pets, titles, summer gear, or tasty foods! * Keep an eye out for hedge mazes in Sanctum and Meridian where many of the Summerfest events are being coordinated. * Added a new 'Bag Sort' button to the inventory bag bar and the bank window. Bag Sort will rearrange the items in your bags to group them into similar categories (Artifacts next to artifacts, crafting items next to crafting items, etc.). * Added a new visual warning that buffs are about to expire; the buff icon now fades out when the duration is getting low. This option can be turned on/off in the Settings > Display menu. * New overhead icons for NPCs help show what they do at a glance! These icons are optional and can be enabled/disabled via the Settings > Misc option: Show additional overhead NPC icons. * The Random Normal and Expert LFG Dungeon queues now give separate weekly rewards, meaning you can now get 7 Normal rewards AND 7 Expert rewards each week. * Quests that allow party-sharing will now be offered to all Raid members. * Experience locking has been removed now that you can set your level lower via Mentoring! * Companion Pets no longer have a summoning/casting time or casting animations. They can only be summoned while out of combat. * Merchants that sell items for large amounts of Planarite or Favor now have their sale value abbreviated if the cost is greater than 9,999. For example, 10,000 will display as '10k'. * Newly-created Guilds now have default permissions that allow all members to use Guild Rally Banners, if the guild has that perk. * Fixed a bug where guilds would be listed in Guild Finder even after transferring to another shard. * Fixed Call of the Ascended not working on players whose corpses were recently teleported. * Looking For Group: Fixed a bug where LFG players not inside the dungeon when the final boss is killed would not receive LFG rewards. * Warriors and Rogues should no longer receive Mana Potions from Ember Isle Reward bags or Tackleboxes from Fishing. * Tells can now be sent to any player on a shard in the same region (NA or EU). Use the Player@Shard format to send messages cross-shard (ex: /tell Asha@Greybriar). Ignore also works the same way - you can ignore someone cross-shard now. * Chat channels are now game-wide by region - North America, Europe, etc. You can now join cross-shard channels on any other shard within your region! - The channels have not been merged together; players can join specific Shards' chat channels from a different shard. For example, a character not on Seastone can be in both 'Healers' - their local Shard's channel - and also '/join Healers@Seastone' to join the Healers channel on the Seastone shard..
* Friends can now be added cross-shard with any player in your wargroup and of your faction. * Members of custom chat channels at the time the channel is set to private/'invite-only' will now properly re-join the channel on future logins (the way it currently works for channel members added after the invite-only setting was enabled). * Viewing a Leaderboard with the 'Top 50' filter selected now shows your actual score at the top instead of a '0' if you're not in the list, and will not incorrectly display your rank as '51'. * Fixed timed scores that ended in zero seconds so they don't omit digits. * New Leaderboards for Conquest have been added to the PvP and Crafting sections, and new Leaderboards for Primeval Feast are under PvE Raids. * Pets now have a maximum active distance from their owner that when reached, will cause them to stop what they're doing and return to you. * Slight tweak to Charge-type attack abilities; the only noticeable change should be that attacks involving a Charge can now critically hit on their own. * NPCs: Riftblade NPCs no longer use Rift Storm. * Wild Growth: Fixed a pushback issue where Wild Growth could be cast faster if the Chloromancer is damaged while casting it. * Wild Growth: Healing from Wild Growth now affects allies who are immune to crowd control effects (such as the Marksman's Strafe). * Essence Surge: Now triggers Natural Awareness when cast. * Controlled Opportunity: Fixed an issue with how this is applied to targets when using mouseover macros. * Haunting Pain: Effects that modify DoT damage, like the Warlock's Neddra's Influence, now properly affect Haunting Pain. * Feign Death: No longer completely despawns pets. Pets will be invisible while Feign Death is active, and reappear as soon as the ability ends or is deactivated. * Neddra's Torture: Fixed a pushback issue where Neddra's Torture could be cast faster if the Necromancer is damaged while casting it. * Fixed Fire Armor and Pyromancer's Armor being castable while Silenced. * Backdraft: Will now deal damage to the target even if they are immune to the Stun portion of the ability. * Mortality: No longer affected by damage pushback when casting. * Baneful Touch: Fixed a tooltip bug where tooltip indicated that this increased poison damage, when it shouldn't. * Virtuoso: Fixed a tooltip bug where the tooltip did not indicate that the effect only works on Codas and not all Finishers. * Fixed a tooltip bug for Keen Strike and Quick Strike. * Predatory Soulstone: The Attack Power buff from Predatory Soulstone should now be triggered when Shadow Fire is cast and not when Shadow Fire deals damage to the target. * Diffuse: Fixed a bug where Diffuse was causing damage abilities with buffs (like Shadow Fire and Annihilate) to be redirected to your pet. * Blood Raptor's Razor Lash now deals damage to enemies around the target instead of enemies within a frontal cone. * Rift Disturbance: Fixed a tooltip bug where the tooltip indicated the ability would grant a Combo Point when it doesn't. * Rift Barrier: Will no longer reflect damage after the absorption from Rift Guard has been consumed. Now generates threat from non-reflectable attacks received while Rift Guard is active. * Increased the projectile speed of all Charges to reduce the occurrence of Detonate not triggering a Charge due to projectile delay. * Removed the application delay of Charges from Rapid Setup. * Fierce Strike: Fixed a bug with Rank 6 that caused it to repeatedly chain damage. * Destroyer's Bearing: Can now trigger off of Deathblow. * Cornered Beast: Now properly grants immunity to Knockback and Polymorph. * Soldier's Bearing: Fixed the tooltip not being updated with the effects of 3/3 Intense Training. * Flurry: Now properly grants immunity to Knockback and Polymorph. * Rift Surge: Fixed a tooltip error where it reported that it was granting too few stacks. * Intercept: Now has a range of 30 meters. * Distractions now properly stack with each other so you can have two Warlords using different Distractions. * The 2-piece set bonus on PvP Synergy Crystals now gives Endurance instead of Max Health. * Players no longer drop random loot or consumables. * PvP Daily Quests that involve collecting items will now flag you for PvP when updated. * Wrath Stone, Mighty Wrath Stone, and Wrath Spikes are no longer available from Templar Whispers and Solomon Dewey. Existing purchased runes will not be affected. * Reduced the notoriety requirements to Honored for purchasing Shoulder slot runes from Templar Whispers and Solomon Dewey. * The achievement description for Warfront Veteran now mentions that Library of the Runemaster will give updates. * Bind-on-Pickup notoriety granting items that drop from some mobs in Gloamwood, Stonefield, Scarlet Gorge, and Droughtlands are now Common-quality items (used to be Uncommon). * Various monsters and objects left over in the world after the War of the Wanton Maw will no longer appear. Ex: The Wanton Captain Urdal will no longer block players from accessing the Adorned Chest in the cave next to Fortune's Shore for the quest 'I Hope You Like Surprises'. He wasn't the kind of surprise intended. * Where the Moon Blossoms: Increased the quantity of Moon Blossoms in the Greybriar Hollow cave. * A Bit of Subterfuge: Female characters will now get disguised as females while on this quest. * Updated the way the Join Adventure button is displayed when near other characters currently doing Instant Adventures. If you or someone in your group is not the right level range for the Adventure, the join button will not be shown. Also cleaned up the way Instant Adventure groups interact with Public groups, especially near Rifts. - Greatly increased the number of gators available for Gator Wrestling. - Added better minimum population of Marine Lurkers for Bug Out. - Available targets should be easier to find for Unleaded Transmutation. - Completing objectives in Simmer Down now awards experience. * A character attempting to log out in a Dungeon or Raid while anyone in the instance is in combat will now take 2 minutes to fully log out, rather than 20 seconds. * Master Mode Dungeons and Raid instances are temporarily unavailable to cross-shard groups. * Rodiafel now goes underground only once at 50% health in both Master and Expert Caduceus Rise. * Dreaded Longshots now briefly pause after spawning before shooting someone in the face with their auto-attack. * Laethys: Resolved a case where gold piles would fail to properly deactivate. * Darkmetal Hauberk now has Focus instead of Hit. * Life-Iron Chain Greaves and Hauberk can now be sold to vendors. * Monastic Hammer, Curious Scarlet Hauberk, and Glacial Hauberk have been re-itemized for Clerics. * Planar Vanquisher's Baton now appears by default for Clerics viewing the merchant. * Steel-Stitched Leather now sorts correctly in the Auction House. * Tent Kit and Silk Tent Kit now give more accurate buff indicators of who they're affecting in your group. * Twilight Bloom Roots now have an appropriate vendor sale price. * Vagabond's Bow can now be sold to NPCs. * Yeti Fur Trinket will now appear in the Auction House under Trinkets instead of Consumables. * Fishing and Survival now have daily quests! * Fishing: New Fishing and Survival recipes are now available! * Inspired chefs have developed a new Feast recipe for more variety in feasting. * The Survivalist and Fisher Artisan store NPCs have arrived. Now you're cooking with MEAT. * The Track Fish ability has been added. If you already have Fishing, you'll find it in the Abilities window. Otherwise it will be granted automatically when training Fishing. * The Undead Fish artifact collection has, at long last, been added to Hammerknell - both Chronicle and Raid. Even more reason to fish in Hammerknell! * Fishing: The Rare Artifact Attractor now works in Hammerknell instances. * The Rare Artifact Attractor will no longer yield common artifacts that existed in the game prior to patch 1.8. * Adjusted drop rate of Fishing Artifacts so that the different rarities are more appropriately distributed. Low-level rare Trophies will now drop more frequently, as will common Fishing-related Artifacts. * When fished, the pools at Scarred Mire and Harlan's Lament will now only yield junk (though some lures will still allow you to catch fish there). * Schools of Fish, Rare Fish, and Clever Fish now sometimes drop treasure chests. * Don't know what to do with your piles of common fish? Now you can turn them into Lures! Check out the recipes on the new artisan store NPC. * Survival: The appearance of Feasts also got updated! 'Feasts' is also a strange looking word when you type it enough. Feasty feast. * Fishing: Tacklebox and fishing treasure loot have been adjusted. * The Crafting Daily quests for 300 skill have been updated! - Added a new reward chest to 300 skill-level Crafting Daily quests. This Master Supply Chest has improved rewards and a chance for a Master Craftsman's Mark. - The Planar Attunement experience crystal reward will now only be available to level 50 characters. - Adjusted material costs for the 300 skill-level Crafting Daily quests. In general, they've been reduced. Material requirements now have more variety and variance between different quests. * Turning in the Armorsmith and Weaponsmith 300-skill crafting dailies when you have both will no longer remove the Wondrous Flux needed for the second daily. * Salvaging items now takes 75% less time per item. * Weekly Quest item recipes now sort under the Quest category on the Crafting window. * Costume item recipes now sort under the Costume category on the Crafting window. * Apothecary: Items in Apothecary Daily reward bags have been adjusted to better match ingredient demand. * Apothecary: Reduced the Drakefoot Seed requirements in some Apothecary recipes. Slightly increased Drakefoot Seed drop rate. * Butchering: Ironhide drop rates increased. * Outfitter: Bulk Recipes have been added to Outfitter Trainers for base materials. These new recipes allow you to process 40 cloth directly into 20 bolts. * Outfitter: Spellspun Cowl recipe now requires 260 skill to learn, to match the skill required to make the item. * Fixed Sliver portals so they should always make noise instead of sometimes being eerily quiet. * Ctrl-C and Ctrl-X now copy and cut text, respectively, from the chat input field. * An away/AFK message entered via /afk or /dnd that is longer than 80 characters will now be shortened rather than causing your character to disconnect. * Added all recurring World Event currencies to the Currency tab - Unique Snowflake, Prize Ticket, Glass Beads, Pyrite Doubloon, and 1.9 World Event currency. * Active buffs/debuffs with durations now show specific time remaining amounts on their tooltips. * Abilities that are on cooldown now show the time remaining in the ability tooltip. * Soul Vitality at 0% now displays a pulsing animation on the portrait Soul Vitality icon. The hover tooltip on the icon now also describes the negative results of dying while at 0% Soul Vitality - stats will be penalized until you visit a Healer. * Fishing Lures now correctly appear under the Misc > Fishing section in the Auction House. * Successful Auction messages now include the stack size of the item sold. * Combat Log text now more closely matches the on-screen combat text color formatting. - There are two new types of damage shown in the Combat Log now: Block and Deflect. Combat Log textfile parsers will likely need to be updated. * Fixed a case where Nameplates could show class mechanic UIs for classes other than your own. * NPCs with very large models will now have their Nameplate anchored at their feet if the normal position is not visible. * Nameplates now show casting bars for both yourself and your target. * In-Game Mail: Removed the subject text auto-complete suggestions since they generally weren't very useful. Sending items will still generate a mail subject for you. * In-Game Mail: Fixed a bug where mail with an invalid destination would sometimes give a conflicting error message and deduct postage. * Several interactions that didn't display text on the cast bar now do. * Improved game framerate when inventory and bank bags are opened. * The Screenshot and Movie save file location is now under the Windows 'My Documents' folder. * Conquête est une bataille suprême inter-serveur, transdimensionnelle et triangulaire en ce qu'elle oppose trois coalitions d'Élus aux prises avec leurs divergences idéologiques profondes sur l'avenir. Être Gardien ou et Renégat n'a aucune importance ; l'enjeu est ici d'écrire la destinée des Élus sur Telara. * Les terres viciées de Mornelande sont le théâtre de ces combats homériques, où guerre rime avec échauffourées isolées comme massives pour la prise de contrôle du territoire, de réserves de pierre de source, d'artisanat de renfort et la réalisation d'objectifs JcE. * Ouvrez la fenêtre JcJ à l'aide de la touche K du clavier et cliquez sur l'onglet Conquête, ou bien sélectionnez Conquête dans la rubrique Activités du menu. * Ralliez l'une des trois coalitions de façon temporaire avant d'entrer dans Conquête, mais choisissez avec sagesse, car vous ne pourrez pas changer d'avis une fois le combat lancé. Si le nombre de participants pour une même faction est trop important, cette faction sera alors indisponible et affichée en gris. * Remportez les combats de Conquête en prenant le contrôle de 60 % des Extracteurs sur la carte, ou en maintenant votre contrôle sur la majorité des Extracteurs après avoir atteint un certain nombre de victimes JcJ pendant l'affrontement. * Lorsqu'une des coalitions a fait Conquête de la zone, leur camp sera seul autorisé à retourner au sein de l'instance… même s'il reste encore des membres des coalitions concurrentes sur le terrain ! Hâtez-vous de détruire les ennemis et focus planaires pour collecter des récompenses supplémentaires au cours de cette phase. * Engrangez des points de Conquête en vainquant vos ennemis et en vous arrogeant les Extracteurs. Les points de Conquête déverrouillent des avantages pour votre personnage que vous pouvez voir dans la fenêtre Conquête. Ces avantages persistent même une fois hors du mode Conquête ! * Amassez de la pierre de source et ramenez-la à votre base pour que les artisans réalisent des améliorations applicables à la coalition entière au cours du combat. * De nouvelles recettes d'artisanat pour Conquête sont disponibles auprès des Intendants présents dans l'instance. * De nouveaux objets sont également en vente libre chez ces mêmes Intendants. * Adressez-vous aux Maîtres de guerre des Gardiens et des Renégats à Sanctum et Méridian pour une nouvelle quête JcJ hebdomadaire dans Conquête. * Le nouveau système de mentorat permet de jouer à un niveau inférieur au vôtre, que ce soit en solo ou avec des amis de niveau plus modeste. * Le mentorat est proposé aux personnages de niveau 15 et plus, et ne peut qu'être utilisé pour abaisser votre niveau actuel, pas pour le rehausser. Votre niveau de mentor doit être inférieur à votre niveau réel d'au moins 5. * La nouvelle option Sélectionner le niveau de mentor s'affiche lorsque vous exécutez un clic droit sur le portrait de votre personnage. Vous pouvez fixer votre niveau de mentor à l'aide de cette option. * Lorsque vous faites un clic droit sur le portrait d'un autre personnage, l'option vous permettant d'aligner votre niveau de mentor sur celui de la cible s'affiche. * Lorsque vous jouez en tant que mentor, vos statistiques, capacités, régénération, etc. sont réduites temporairement afin que vous soyez en phase avec le niveau choisi. * Les personnages dans un groupe où un membre est mentor recevront de l'expérience en bonus tant que le mentor demeure à 3 niveaux d'écart du personnage au niveau le plus bas qu'il supervise. * Vous pouvez également fixer votre niveau de mentor via la commande /niveaumentor. * De nouvelles Aventures instantanées sont désormais disponibles à Bois d'Argent, Libremarche, au Bois du Crépuscule et au Champ de Pierre. * Ces nouvelles Aventures sont d'une difficulté appropriée pour les zones où elles se déroulent, et pour faire un pont avec le nouveau système de mentorat, elles peuvent aussi bien ravir les personnages de plus haut niveau qui ont envie de changer de décor ! * Si votre personnage se trouve dans l'une des quatre zones précitées et est mentor dans la fourchette de niveaux de la zone en question (que vous jouiez solo ou soyez mentor d'un personnage de niveau inférieur), vous pourrez entrer en file d'attente pour participer aux Aventures instantanées de cette zone. Les personnages qui ont un niveau réel correspondant à la difficulté de la zone auront aussi cette opportunité. * Les personnages de plus haut niveau qui ne sont pas déjà mentors peuvent dorénavant entrer en file d'attente pour les Aventures aléatoires, qui vous feront automatiquement passer en mentor au niveau adéquat pour prendre part à ces aventures de zone plus facile, si un groupe est toutefois disponible. Mais la file d'attente peut également vous placer dans des groupes d'Aventure instantanée de plus haut niveau, le cas échéant. * Vous pouvez obtenir des récompenses en bonus pour les 14 premières Aventures aléatoires que vous accomplissez chaque jour. * Les récompenses en points d'expérience et pierres de source demeureront en adéquation avec le niveau réel de votre personnage, même si vous avez baissé de niveau pour être mentor. * Si vous abaissez votre niveau de mentor pour participer à des Aventures instantanées de difficulté moindre, vous recevrez de l'expérience de mentor en prime de la même manière qu'être mentor hors Aventure instantanée vous en donne. * Les Caches d'objets obtenues lors d'Aventures instantanées de difficulté inférieure peuvent contenir de l'équipement vert étalonné sur le niveau réel et la vocation de votre personnage. Les personnages qui montent leur niveau et participent à ces nouvelles aventures trouveront ces objets comparables aux récompenses de quête correspondant à leur niveau réel... Du coup, vous ne ratez rien à gravir les niveaux grâce aux Aventures instantanées ! * Vous en aviez rêvé, ils sont arrivés : les PNJ stylistes et coiffeurs ont désormais pignon sur rue à Méridian et Sanctum ! * Contre une menue somme, les personnages pourront modifier le moindre aspect de leur apparence excepté la race et le sexe. Les tarifs peuvent aller d'une simple retouche cosmétique (nouvelle couleur de cheveux ou coupe) à des changements radicaux (taille du personnage, traits du visage et pigmentation de la peau). Vous pouvez voir le coût total de tous vos changements esthétiques depuis l'interface de personnalisation. * Un nouveau Prisme de réalité a été décelé aux Plaines Arides ! * En guise de « suggestion d'accompagnement » du plat de résistance qu'est le raid d'Aurore Infernale, le Prisme du Festin primitif a été conçu pour être plus ardu que les défis imposés par l'Envol du Phénix, et dispose de récompenses plus puissantes, comme il convient. * Twyl, le Seigneur des Fées, après avoir assimilé le pouvoir de Vertécaille, a imposé son joug sur cette réalité. Le Plan de la Vie conquiert les terres et dévore tout à sa portée, tant et si bien que les proies se font rares. Les adorateurs se tournent alors vers Vertécaille lui-même dans une tentative de se nourrir du dragon de la Vie et de son essence. Il incombe aux Élus de leur administrer une bonne correction avant que le Seigneur Twyl et ses laquais ne se répandent dans d'autres Prismes de Telara pour assouvir leur faim. * Les rangs de prestige vont désormais jusqu'à 50 ! * Les rangs supplémentaires vous permettent de décrocher de nouveaux titres-clés et du bonus d'expérience lorsque vous les atteignez (2 niveaux d'Harmonisation planaire à chaque rang). * Afin d'être en adéquation avec l'augmentation du nombre de rangs de prestige, un nouvel ensemble d'armure JcJ est désormais disponible. * Des dégâts et de la concentration ont été ajoutés aux armes des ensembles JcJ 2 à 5. Ces valeurs devraient être équivalentes à 2 paliers en-dessous de celles des armes JcE comparables. * Afin d'être en adéquation avec l'ajout de nouvel équipement JcJ, l'effet du Fortifiant a été étendu. Celui-ci s'applique dorénavant à tous les personnages jusqu'au rang 36, en Conquête ou en champ de bataille. * On embarque son pique-nique et on n'oublie pas son spray anti-moustiques, les Élus ! Le Festival d'été vient irradier Telara, et nulle menace planaire ne pourrait forcer les habitants à rester cloîtrés en ville ! * Profitez du grand air avec ce nouvel événement annuel ponctué d'activités que tout le monde adore. Partez en chasse au trésor, piégez des bêbêtes toutes mimis pour en faire des compagnons, faites la course dans une chute d'eau ou partez simplement faire un pique-nique au bord de mer... mais gardez l'œil ouvert au cas où le Seigneur de l'Essaim et ses bestioles veuillent s'inviter ! * Les devises d'événement du Festival d'été peut être dépensées contre des tonnes de nouveaux objets bien sympas : des costumes et effets de transformation physique, de nouveaux familiers, des titres, de l'équipement spécial été et des victuailles à tomber par terre ! * Pensez à repérer les labyrinthes végétaux à Sanctum et Méridian, où de nombreuses réjouissances du Festival d'été sont organisées. * Un nouveau bouton, « Tri auto des sacs », a été ajouté dans la barre des sacs de votre inventaire ainsi que dans la fenêtre de la banque. Il vous permet de réorganiser les objets de vos sacs en les regroupant par catégories similaires (par exemple, les artefacts avec les artefacts, les objets d'artisanat avec les objets d'artisanat, etc.). * Une nouvelle alerte visuelle vous prévient à présent lorsque vos améliorations sont sur le point d'expirer (paix à leur âme), l'icône s'estompant lorsque leur durée devient dangereusement courte. Cette option peut être activée ou désactivée via le menu Paramètres > Interface. * Avec les nouvelles icônes apparaissant au-dessus de la tête des PNJ, vous savez en un clin d'œil ce qu'ils font ! L'affichage de ces icônes est optionnel et vous pouvez l'activer ou le désactiver via l'option « Afficher les icônes au-dessus de la tête des PNJ » dans Paramètres > Interface > Divers. * Les files d'attente RdG pour donjon Normal et Expert permettent dorénavant d'obtenir des récompenses hebdomadaires distinctes, ce qui signifie que vous pouvez maintenant avoir 7 récompenses en mode Normal ET AUSSI 7 récompenses en mode Expert chaque semaine. * Les quêtes pouvant être partagées seront désormais proposées à tous les membres du raid. * Le verrouillage d'expérience a été supprimé afin que vous puissiez abaisser votre niveau via le mentorat ! * Les compagnons n'ont plus de temps ni d'animation ni d'invocation. Ils ne peuvent être invoqués que hors combat. * Les prix de vente des marchands proposant des objets contre une grande quantité de Planarites ou de Faveurs ont été abrégés lorsque le montant est supérieur à 9 999. Par exemple, 10 000 sera affiché « 10k ». Quoi, vous préféreriez une ristourne !? Il vous en faut toujours plus, pas vrai : la Pierre de source, l'argent de la Pierre de source et le sourire de Laethys ! * Les guildes récemment formées ont dorénavant par défaut la possibilité d'autoriser tous les membres d'utiliser la Bannière de rassemblement de la guilde, si cette dernière dispose de ce privilège. * Les guildes qui procédaient à un transfert de serveur pouvaient toujours être listées dans l'outil de Recherche de guilde sous leur serveur précédent. Ce bug a été corrigé. * Le privilège de guilde « Appel des Élus » ne fonctionnait pas sur les joueurs dont les cadavres venaient d'être récemment téléportés. Ce bug a été corrigé. * Recherche de groupe : les joueurs en groupe créé par l'outil RdG qui n'étaient pas à l'intérieur du donjon au moment où le boss final était éliminé ne recevaient pas les récompenses RdG. Ce bug a été corrigé. * Les Guerriers et les Voleurs ne devraient plus recevoir de potions de mana via les Sacs de récompenses de l'Île de Braise ni les Boîtes de pêche. * Vous pouvez dorénavant communiquer avec des joueurs sur tout serveur appartenant à la même région que vous (Amérique du Nord ou Europe). Pour vous adresser à un joueur d'un autre serveur, utilisez le format suivant : /msg @[nom du serveur] (exemple : /msg Asha@Brisesol La forme, Asha ?). Vous pouvez ignorer un joueur de la même façon. * Vous pouvez maintenant discuter dans l'ensemble du jeu par région (Amérique du Nord, Europe…). Les canaux sont inter-serveurs et ouverts à tous les joueurs d'une même région, quel que soit leur serveur de jeu ! - Les canaux n'ont pas été fusionnés. Les joueurs peuvent rejoindre les canaux de discussion de serveurs spécifiques à partir d'un serveur différent. Par exemple, un personnage qui n'est pas sur Brisesol peut suivre les deux canaux « Soigneurs » : celui de son serveur local, et également son équivalent sur Brisesol via la commande « /rejoindre Soigneurs@Brisesol ». * Vous pouvez désormais ajouter des amis issus d'autres serveurs que le vôtre à partir de tout joueur inclus dans votre groupe, à condition d'être de la même faction. * Les participants d'un canal de discussion privatif au moment où ce canal est réglé sur « privé/uniquement sur invitation » seront désormais correctement re-inclus au canal lors de leurs futures connexions (à la manière des participants ajoutés à la conversation après que le paramètre « uniquement sur invitation » a été activé). * Si vous filtrez le classement afin d'afficher le « Top 50 » et vous n'en faites pas partie, votre score se retrouvera en haut de liste, au lieu du « 0 » qui y figurait, et votre rang ne mentionnera plus incorrectement « 51 ». * Les scores chronométrés qui terminaient par 0 ont retrouvé leur intégrité. * De nouveaux classements pour Conquête ont été intégrés aux catégories JcJ et Artisanat, par ailleurs les classements pour le Festin primitif sont désormais sous « JcE Raid ». * Vos familiers ne pourront plus dorénavant se promener en toute liberté ; lorsqu'ils atteignent la distance maximale, ils interrompront ce qu'ils sont en train de faire et reviendront vers vous. * Les capacités d'attaque de type Charge ont été légèrement modifiées ; tout ce que vous devriez remarquer, c'est que ces attaques peuvent désormais infliger des coups critiques à elles seules. * PNJ : les PNJ Saigneurs des Failles n'utilisent plus Tempête de Faille. * Croissance sauvage : lorsque le Chloromancien subissait des dégâts en incantant ce sort, subir un recul lui permettait de le lancer plus rapidement. Logique (??!). Ce bug a été corrigé. * Croissance sauvage : les soins de cette capacité s'appliquent dorénavant aux alliés qui sont immunisés contre les effets de contrôle de foule (comme Salve, du Tireur d'élite). * Poussée d'essence : déclenche désormais Conscience naturelle au moment de son lancement. * Opportunité contrôlée : ne s'appliquait pas correctement aux cibles lorsque vous utilisiez des macros de déclenchement au passage de votre souris. Ce bug a été corrigé. * Douleur obsédante : les effets qui modifient les dégâts répétés, tels que l'Influence de Neddra de l'Anathema, affectent dorénavant correctement cette capacité. * Mort simulée : ne fait plus complètement disparaître les familiers. Ces derniers demeurent invisibles tant que la capacité est activée et réapparaissent une fois que celle-ci prend fin ou est désactivée. * Torture de Neddra : lorsque le Nécromancien subissait des dégâts en incantant ce sort, subir un recul lui permettait de le lancer plus rapidement. Ce bug a été corrigé. * L'Armure de feu et l'Armure de Pyromancien ne peuvent plus être invoquées en étant sous silence. * Retour de flammes : infligera dorénavant des dégâts à la cible même si cette dernière est immunisée contre les effets d'étourdissement de la capacité. * Mortalité : n'est plus affectée par les dégâts de recul lors de l'incantation. * Contact néfaste : l'infobulle décrivant cette capacité indiquait que celle-ci augmentait les dégâts de poison, alors que ce n'était pas le cas. Quelle petite empoisonneuse, celle-là ! Ce bug a été corrigé. * Virtuose : l'infobulle, une deuxième comique en herbe, omettait de préciser que l'effet ne s'appliquait que sur les Codas et non pas sur toutes les attaques finales. Ce bug a été corrigé. * Les infobulles de Frappe aiguisée et de Frappe rapide ont été corrigées. * Pierre d'âme prédatrice : l'amélioration de la puissance d'attaque de la Pierre d'âme prédatrice devrait dorénavant s'activer lorsque Feu de l'ombre est lancé, et non lorsqu'il provoque des dégâts à la cible. * Garde du corps : son utilisation forçait certaines capacités de dégâts améliorées (par exemple, Feu de l'ombre ou Annihilation) à se rediriger vers votre familier. Ce bug a été corrigé. * La capacité Flagellation acérée du Raptor de sang inflige maintenant des dégâts aux ennemis autour de la cible, et non plus seulement aux ennemis qui font face à votre familier. * Perturbation de Faille : l'infobulle (encore une farceuse) indiquait que la capacité accordait un point de combo, alors que ce n'était pas le cas. Ce bug a également été corrigé. * Barrière de Faille : ne renverra plus les dégâts après fin des effets d'absorption de Garde-Faille. Génère dorénavant de la menace avec les attaques reçues ne pouvant être renvoyées si Garde-Faille est activée. * La vitesse de projectile de toutes les charges a été accrue afin d'éviter que Détonation n'oublie de déclencher une charge à cause d'un retard de projectile. * Retrait du délai de l'application des charges de la capacité « Mise en place rapide ». * Frappe féroce : au rang 6, cette capacité provoquait des dégâts enchaînés de manière répétée. Ce bug a été corrigé. * Allure de destructeur : peut s'activer dorénavant à partir de Coup mortel. * Bête acculée : vous immunise à présent bien contre les effets de transformation et de renversement. * Allure de soldat : l'infobulle a été revue afin d'inclure les effets issus de Formation intense au rang 3. * Déluge de coups : vous immunise à présent bien contre les effets de transformation et de renversement. * Poussée de Faille : l'infobulle indiquait de façon erronée que la capacité ne rapportait que trop peu d'accumulations. * Interception : a dorénavant une portée de 30 mètres. * Les Distractions s'accumulent bien désormais, deux Maîtres de guerre peuvent donc utiliser des Distractions différentes. * Le bonus de deux pièces d'armure des Cristaux de synergie JcJ procurent désormais de l'endurance au lieu des points de vie maximum. * Les joueurs victimes ne laissent plus de butin aléatoire ni de consommables à ramasser sur leurs dépouilles. * Les quêtes JcJ journalières qui impliquent de collecter des objets vous marqueront pour un combat JcJ lorsqu'elles se mettront à jour. * Pierre de courroux, Pierre de courroux puissante et Ronces de courroux ne sont plus disponible auprès du Templier Whispers (qui ne murmure plus) ni de Solomon Dewey. Vos runes existantes déjà achetées ne seront pas affectées. * Le niveau de notoriété requis pour acheter des runes pour épaules auprès du Templier Whispers et Solomon Dewey a été ramené à Estimé. * La description de l'exploit « Vétéran du champ de bataille » mentionne dorénavant que la Bibliothèque des maîtres des runes compte dans sa réalisation. * Les objets liés une fois ramassés vous procurant de la notoriété que vous pouvez obtenir auprès de certains monstres dans Bois du Crépuscule, Champ de Pierre, Gorges Écarlates et Plaines Arides sont désormais communs (contre peu communs, auparavant) en termes de qualité. * Là où la lune fleurit : il y a plus de Fleurs de lune dans la caverne du Creux de Roncegrise. * Pieux subterfuge : que la gente féminine se rassure, les personnages seront dorénavant bien déguisés avec les bons attributs. * L'affichage du bouton « Rejoindre l'aventure », lorsque vous vous trouvez à proximité d'un groupe d'Aventure instantanée, a été modifié : le bouton ne s'affichera pas si vous ou un membre de votre groupe n'avez pas le niveau requis pour rejoindre l'Aventure. Les interactions entre les groupes d'Aventure instantanée et les groupes publics ont aussi été corrigées, notamment à proximité des Failles. - Le nombre de reptiles disponibles pour Soumission d'alligators a été considérablement augmenté. - Amélioration du nombre minimal d'Embusqués marins pour Massacre de scarabées. - Les cibles disponibles devraient être plus facilement identifiables pour Transmutation sans plomb. - Remplir des objectifs de Refroidissement rapporte désormais de l'expérience. * Si un personnage tente de se déconnecter depuis un donjon ou un raid lorsque tout le monde dans l'instance est en combat, il lui faudra 2 minutes pour être complètement déconnecté, au lieu de 20 secondes. * Les instances de donjons et raids en mode Épique sont momentanément fermés aux groupes inter-serveurs. * Dans les modes Expert et Épique, Rodiafel joue désormais à l'autruche une fois seulement lorsqu'il lui reste la moitié de ses points de vie. * Les Tireurs d'élite terrifiants sont désormais immobiles un court instant, juste après leur apparition, avant de lancer une attaque automatique en plein crânes d'Élus. * Laethys : les Piles d'or peuvent désormais se désactiver correctement. * Le Haubert en sombracier dispose désormais d'un bonus de concentration au lieu d'un bonus de dégâts. * Les Grèves et le Haubert en fer de la Vie peuvent désormais être revendus auprès des marchands. * Le Marteau monastique, l'Étrange haubert écarlate et le Haubert glacial ont vu leurs statistiques remaniées pour les Clercs. * La Matraque du vainqueur planaire apparaît par défaut sur l'interface pour les Clercs qui consultent son marchand. * Le Cuir cousu d'acier est maintenant correctement classé dans la salle des ventes. * Les Tentes à monter et les Tentes en soie en kit indiquent désormais plus clairement les membres du groupe qui bénéficient de l'amélioration. * Les Tiges de fleur du crépuscule sont vendues à un prix décent chez les marchands. * L'Arc de vagabond peut dorénavant être revendu aux PNJ. * La Babiole en fourrure de yéti apparaîtra désormais à la salle des ventes sous la catégorie Babioles au lieu de Consommables. * Il y a à présent des quêtes journalières de pêche et de survie ! * Pêche : de nouvelles recettes de pêche et de survie sont désormais disponibles ! * Des cuisiniers inspirés ont mis au point une nouvelle recette de festin qui va réveiller vos papilles. * Les nouveaux PNJ vendeurs d'artisanat pour la pêche et la survie ont débarqué et ils raviront tous les cordons-bleus amateurs de viande rouge ! * La capacité Détection des poissons a été ajoutée. Si vous êtes déjà un pêcheur, vous la trouverez dans votre fenêtre de Capacités. Sinon, vous l'obtiendrez automatiquement lorsque vous apprenez la pêche. * La collection d'artefacts « Poisson mort-vivant » tant attendue a, enfin, été ajoutée à Glasmarteau — à la fois dans sa Chronique et son raid. Voilà une bonne raison de plus de pêcher à Glasmarteau ! * Pêche : l'Attracteur d'artefacts rares fonctionne maintenant dans les instances de Glasmarteau. * L'Attracteur d'artefacts rares ne vous permettra plus d'obtenir des artefacts ordinaires qui existaient dans le jeu avant la mise à jour 1.8. * Le taux d'obtention des artefacts de pêche a été ajusté de façon à ce qu'ils soient attribués en butin de manière plus homogène et selon leur rareté variable. Les Trophées de pêche rares de bas niveau seront ainsi dispensés plus souvent, de même que les artefacts ordinaires en lien avec la pêche. * Lorsque vous pêchez dans les bassins du Bourbier Balafré et de la Lamentation de Harlan, vous n'obtenez désormais que des déchets (sauf si vous pêchez avec certains leurres qui vous permettent d'y attraper du poisson). * Les Bancs de poissons, de poissons rares et de poissons malins cachent dorénavant parfois des coffres au trésor à récupérer. Bonne pêche… ou bonne chasse, c'est comme vous préférez ! * Vous ne savez pas quoi faire de vos poissons ordinaires ? Maintenant, vous pouvez les transformer en appâts ! Pratique, même si la crise de la vache folle n'a visiblement pas servi de leçon à nos développeurs (donner à manger du poisson à des poissons, hum hum). Jetez un œil aux recettes de nos nouveaux PNJ vendeurs d'artisanat pour trouver votre bonheur. * Survie : les festins ont désormais l'air plus ragoûtant ! * Pêche : les butins des boîtes et des trésors de pêche ont été réajustés. * Les quêtes journalières d'artisanat pour niveau 300 de compétence ont été mises à jour ! - Ajout d'un nouveau coffre au trésor pour les quêtes journalières d'artisanat pour niveau 300. Ce coffre de matériel pour Maître-artisan contient des objets supérieurs et a une chance de renfermer une Marque de Maître artisan. - Le cristal d'expérience d'Harmonisation planaire offert en récompense sera dorénavant uniquement utilisable par les personnages de niveau 50. - Le coût des matériaux des quêtes journalières d'artisanat pour niveau 300 a été ajusté. Leurs prix ont été globalement réduits. Les objectifs des différentes quêtes pour obtenir des matériaux sont désormais plus variés. * Lorsque vous rendez l'une de vos quêtes d'artisanat journalières de fabricant d'armures ou d'armes de niveau 300 et vous possédez un Flux merveilleux pour chacune, le Flux de la deuxième quête ne passera plus à la trappe. * La récupération de matériau a été écourtée de 75 % de sa durée. * Les recettes d'objets des quêtes hebdomadaires sont maintenant classées dans la rubrique Quête de la fenêtre d'artisanat. * Les recettes d'éléments de costume sont maintenant classées dans la rubrique Costume de la fenêtre d'artisanat. * Apothicaire : les objets des sacs de récompenses quotidiens pour apothicaire ont été modifiés pour mieux correspondre à la demande d'ingrédients. * Apothicaire : certaines recettes requièrent dorénavant moins de Graines de patte-de-drake, qui sont par ailleurs un peu plus abondantes. * Boucherie : la Peau de fer sera plus fréquemment octroyée. * Tailleur : les entraîneurs de tailleur proposent désormais de nouveaux patrons, appelés « Cargaisons », au rendement supérieur pour les matériaux de base. Ceux-ci vous permettent de coudre 40 carrés d'étoffes pour en faire 20 rouleaux. * Tailleur : l'apprentissage du patron de la Capuche ensorcelée requiert des compétences égales à 260 afin d'être en adéquation avec le niveau de compétence nécessaire pour fabriquer cet objet. * Les portails des Prismes de réalité émettent à présent un son constant et ne restent plus étrangement silencieux par moments. * Désormais, Ctrl+C et Ctrl+X permettent respectivement de copier et coller du texte dans le champ de saisie de la fenêtre de discussion. * Si vous saisissez un message d'absence via les commandes /abs ou /npd dépassant les 80 caractères, votre personnage ne sera plus déconnecté et le message sera tout simplement raccourci. * Toutes les devises récurrentes des événements mondiaux figurent dorénavant dans l'onglet Devises : Flocon de neige unique, Bon pour un prix, Perles en verre, Doublon de pyrite ainsi que la devise de l'événement mondial de la 1.9. * Les infobulles des améliorations/affaiblissements à durée limitée qui sont activés affichent dorénavant le temps restant. * Les capacités soumises à délai de récupération affichent désormais le temps restant dans leur infobulle. * La Vitalité de l'âme à 0 % est désormais signalée par un effet de pulsation sur l'icône du portrait de personnage. L'infobulle qui apparaît au passage du curseur de la souris décrit par ailleurs les impacts négatifs d'une mort à 0 % de Vitalité d'âme : les statistiques seront pénalisées jusqu'à ce que vous rendiez visite à un Guérisseur. * Les appâts de pêche s'affichent dorénavant correctement dans la salle des ventes sous la rubrique Divers > Pêche. * Les messages que vous recevez lorsque vous avez réussi une enchère indiquent dorénavant le nombre d'exemplaires d'un même objet que vous avez vendu. * Le code couleur du texte du journal de combat correspond dorénavant plus à celui du texte de combat s'affichant à l'écran. - Deux nouveaux types de dégâts figurent dans le journal de combat à présent : blocage et déviation. Les outils d'analyse de données de combat (ou « parsers ») devront certainement être mis à jour. * Les tags de personnage affichaient parfois sur l'IU des mécaniques de classes différentes de la vôtre. Ce bug a été corrigé. * Les tags de PNJ taille XXXL s'afficheront désormais à leurs pieds, lorsque l'emplacement habituel n'est pas visible. * Les tags de personnage montrent désormais les barres d'incantation pour vous et votre cible. * Courrier en jeu : retrait des suggestions auto-saisies pour le champ Objet en raison de leur utilité très relative. L'envoi d'objet générera par défaut un sujet pour votre message. * Courrier en jeu : lors de l'envoi d'un message vers une destination non valide, un message d'erreur contradictoire pouvait apparaître et les frais d'expédition étaient prélevés. Ce bug a été corrigé. * Plusieurs interactions n'enclenchaient pas l'affichage de texte dans la barre d'incantation. Ce bug a été corrigé. * Amélioration de la vitesse d'affichage lorsque l'inventaire ou la banque sont ouverts. * Le dossier de sauvegarde des captures d'écran et des vidéo a déménagé. Veuillez noter sa nouvelle adresse : Place « Mes Documents », dans la charmante commune de PC-sous-Windows. * Les membres des canaux de discussion appartenant à différents groupes de guerre peuvent désormais converser sur ces canaux. * Aventure instantanée : des joueurs de serveurs différents pouvaient parfois se retrouver dans le même groupe d'Aventure instantanée aléatoire. Ce bug a été corrigé (chacun son serveur et les Failles seront bien gardées). * Conquête : le jeu pouvait planter lorsque vous vous éloigniez d'un Extracteur de conquête sur le point d'être contrôlé. Ce bug a été corrigé. * Fabricant d'armes : la quête journalière qui ne donnait pas le Flux merveilleux approprié a été corrigée comme il se doit. * Saga de la Mort : Les forces du Plan de la Mort : l'objectif chiffré de la quête à accomplir a été réduit et certaines Failles qui ne comptaient pas dans la progression ont elles aussi subi les corrections qui s'imposent.